Did I mention that I’ve given up drinking while I’m in diet mode? Given the work I do, I have allowed for a few exceptions. Like when I’m invited to judge a cocktail contest, I’ll find a way to deal with those liquid calories. But no more beers after mowing the lawn, no glass of whiskey at the end of the day, and no wine with dinner. Although I do allow myself one glass of wine on Friday. Speaking of stupid diet rules, there are also no fried food, and especially no donuts. However, when work calls, work calls. Did you hear that ringing? Mark your calendars. A week from tomorrow is the Fussy Little Tour nobody wants to miss. Saturday, September 9 will be the Tour de Cider Donut: Champion Edition. It will be our eighth annual outing, and we’re going to visit five of the past seven winners. So there’s no need for a nomination phase. The math savvy among you will realize that two past winners have been excluded. Hicks orchard up by Lake George won the tour back in 2012, but I vowed never to return given the distance. Also, Cider Belly is getting a bye into the grand finale. We need to find out who is best out in the country, before we pit that donut against this amazing Albany doughnut maker. But all the details will come next week. Because that thing I mentioned about judging a cocktail contest? That actually happened. Last Friday night, the Savoy Taproom hosted an Elijah Craig whiskey sour contest in honor of National Whiskey Sour Day. But there was a twist. Naturally, the best bartenders in the Capital Region are all busy on Friday nights. However, George Fiorini who is the Chief Beverage Officer at Savoy has been teaching cocktail classes on a regular basis. So he invited some of the most promising students from the class to compete. I was joined on the judging panel by Jackie from Southern Wines & Spirits who represents the Elijah Craig brand in our region, and Katy Aitchison who tends the bar at Wellington’s. As usual, whenever sitting down to taste a series of similar things, the experience was illuminating. A while back, I wrote about the scoring for this event. And actually, the event itself worked out a bit different than I anticipated. Instead of judging these live on stage, the judges were sequestered over to a remote table, so we could blindly evaluate the drinks. Part of me would really have liked to see how these students built their drinks. I’d like to see the poise of the pours, the confidence of their shakes, and the finesse of their strains. But I also appreciated the integrity of simply judging the drink on its own merits. So in the end, we were presented with six whiskey sours. The goal was to come up with our top three. And one was eliminated from the official competition, because Daniel Atkins who owns Savoy stepped in to present his own drink made with a peach black tea, lemon, aqua faba, and garnished with a nectarine slice. It was delicious. But let’s focus on the students. The first drink was all about the peach, with a fat slice of peach in the drink, along with Domaine Canton, aqua faba, and a sprig of mint garnish. And I have to say that the aqua faba was gorgeous on this one. It was the silkiest of the group, and had the best weight in the mouth. But there were a couple of missteps. The garnish of the mint sprig over the side of the glass just looked wilted. But more importantly, the peach elements of the drink overpowered everything else. Drink number two was really the only traditional whiskey sour we were served, but it came with a slight twist. 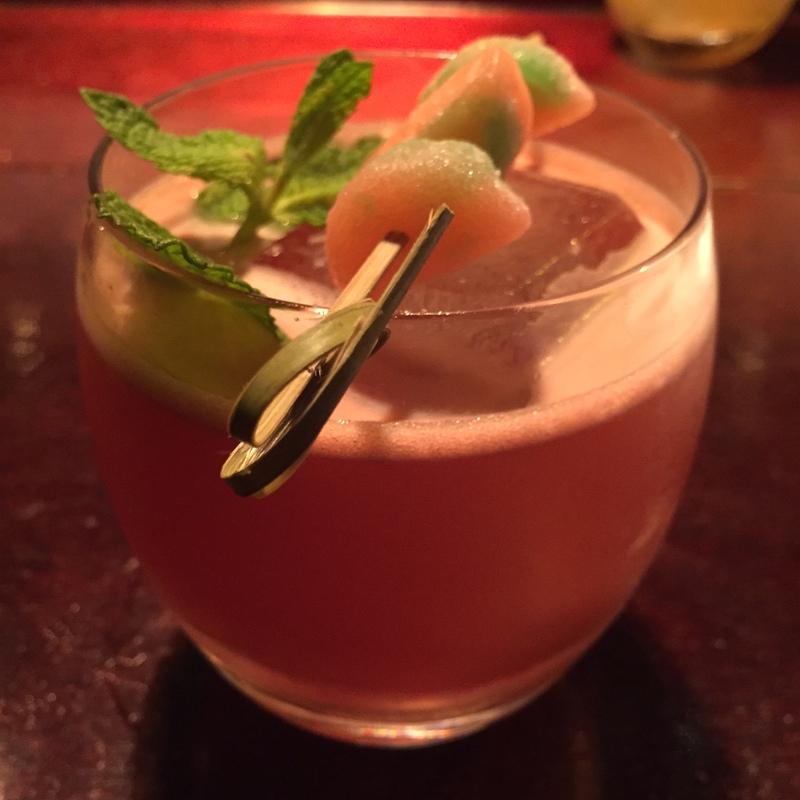 This was made with lemon, aqua faba, blood orange bitters, a bit of Canton, and garnished with a single mint leaf. Of all the drinks we tried from the students, this was the most balanced, with the accompanying flavors adding nuance, but not distracting from the whiskey sour as a whole. The froth could use a bit of work, and it would have been better if more of the whiskey came through, but overall, this was a winner. Dan’s was drink number three. And not only was it fantastic, but it kept getting better as it sat. 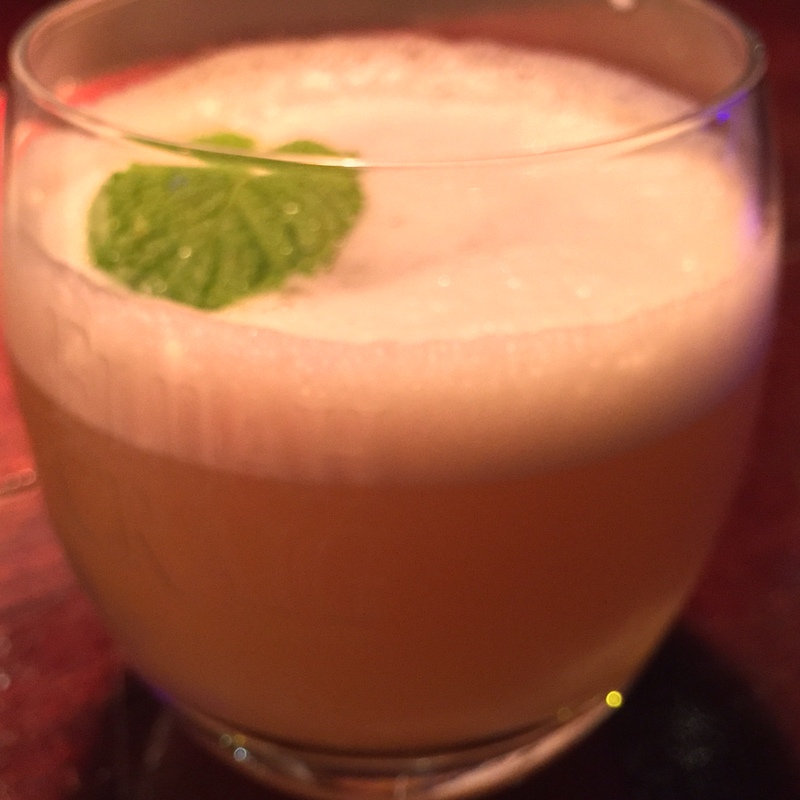 The judges kept returning for sips of this stone fruit spiked whiskey sour. The fourth drink was the first to not use the aqua faba, opting for a frothless sour made simply by adding PAMA liqueur, lemon, simple syrup, a spritz of Canton, and lemon zest. While I appreciate the simplicity, wasn’t much to look at, and the proportions were off. Part of the issue, at least where appearance is concerned, I’m sure was the large glass and ice cube. The glass arrived looking mostly empty. The judges could see what the student was trying to achieve, but it needed a bit more work. The fifth drink was my personal favorite since I like things on the tart side, but it also had a lot going on. This drink was also challenged our notion of what a whiskey sour could be. 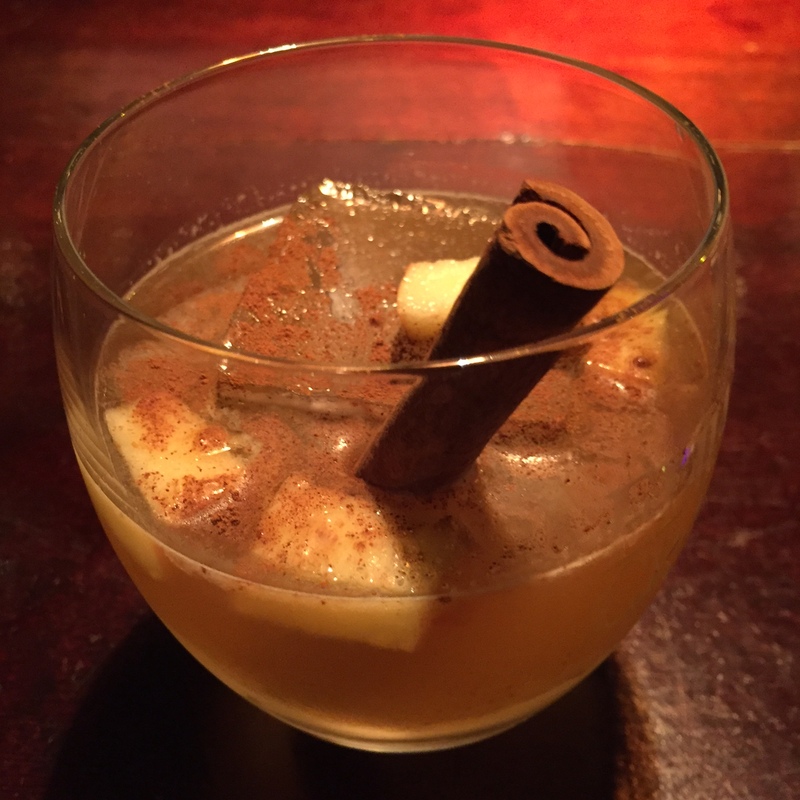 This one had lemon juice (squeezed an hour in advance), pure maple syrup, cinnamon, local organic apples, and garnished with a cinnamon stick. From the description and appearance, I thought I was going to hate it. But I didn’t. I loved it. What I didn’t love was all the powdered cinnamon, and I think the drink could have been tighter if many of the flavors were combined into a maple-cinnamon syrup. Then the whole thing could be garnished with a more decorative slice of apple. I also expected to hate the sixth drink which included fresh squeezed watermelon juice, PAMA, simple syrup, and sour patch watermelon segments. The glass was also rimmed with the candy’s sour coating. Was it my favorite? No. But I didn’t hate it. The other judges loved it. And I did like it better when I took a sip after eating one of the candies, which helped to check its overall sweetness. But there was no mistaking that this audacious drink looked beautiful in the glass. In the end, the top three drinks were clear, and it came down to a one point game. The watermelon drink that came in third place was made by Brandon John, who was actually the only student who works in the industry. You can find him at Black & Blue. He speaks highly of the Verano Verde cocktail at the bar there, which is made with mezcal and basil. It sounds totally up my alley, so I’m looking forward to giving it a dry. The maple apple sour took second and was made by Kateri Turner. She works for the state, but doesn’t like to define herself by her job. She’s all about the outdoors, and apparently kickball as well. I had no idea the Capital Region had a league, but she says it’s huge and a ton of fun. First prize went to Jen Manierre, for her restrained use of blood orange bitters and Domaine Canton in a twist on a very traditional whiskey sour. During the day she works for NYSERDA, but I’m hoping that this victory might push her to seeking out a night shift and honing those cocktail making skills even further. Congratulations to them all, and everyone who competed in the contest. And thanks once again to George for inviting me out, and Elijah Craig for sponsoring the event.